Puppy house breaking any dog takes persistence and patience but with Danes we have a head start as compared to other dog breeds! Puppy house breaking and potty training your Great Dane..
Lucky for us Dane puppies are quite smart and respond well to training! Plus, their larger size means a larger bladder, this translates into "less frequent" need to urinate, as compared to those miniature breeds. A watchful eye, timely schedule, and basic understanding of your puppy's needs are all you need to be successful. 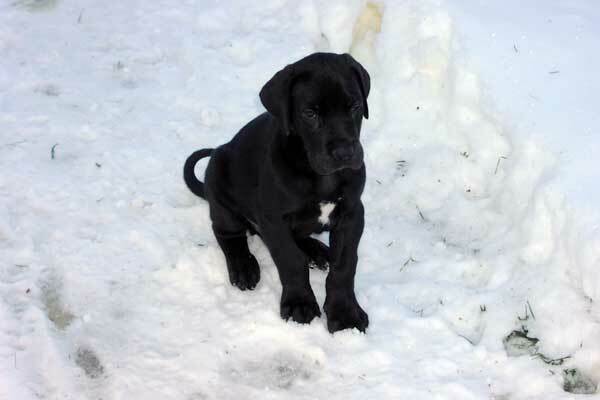 Your Great Dane puppy wants to please you and should catch on pretty quickly. Before we begin, your Great Dane puppy should be comfortable within your home, content and cozy while in his puppy crate or den. If you missed our article explaining the importance of crating, please visit our Great Dane puppy training page. Tip: Don't wait around for your pup to "finish", encourage them to "hurry up" and be sure they learn that outside is for potty only. We'll leave the playing until after they get it. "Hurry up", "do your business", "good boy", you guessed it, using commands, whichever you choose, will help stimulate your pup to relieve itself. Begin with a feeding schedule, don't "free feed", whether you feed twice or three times a day the feeding schedule is extremely important. Take your dog out to the same spot every time, first thing in the morning, every couple of hours during the day and right before bed. Don't let him roam or run about and play when outside, let him know that outside is for bathroom only! Use a command, whichever you choose and keep saying it, repeat the command until the dog relieves itself or "does his business" then praise him like crazy! 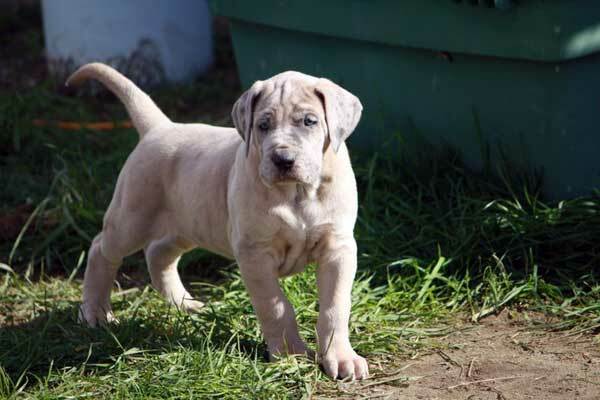 Feed your Great Dane puppy in its crate, wait about 10 minutes then quickly take him outside, use your "command", give lots of praise and even a treat when he's finished for being such a good dog. In just a few days, your puppy will know where the bathroom is. House breaking tip: Accidents can and will happen, you'll have to deal with it. When your puppy has an accident inside, take some of the mess from inside and bring it out to the bathroom area, this will help stimulate him to go the next time outside. I'm sure by now you are making great progress with puppy house breaking but remember, your baby dog will have minimal bladder control until about six months old. Take him out every couple hours, after meals or play time, and definitely within 10 minutes of his last drink. If your Great Dane puppy has an accident, correct it with a stern "No" then take him outside and show him where he's expected to go. Don't ever rub his nose in the mess, this will only confuse him. Puppies have a very short memory so if you don't catch them in the act, they won't know why they're being scolded. Use a pet stain and odor remover to clean up the mess, we don't want puppy to get a whiff of an old accident and go on the same spot. For the first few months' repetition, schedule, commands and praise are critical to puppy house breaking success. Always keep your Great Dane puppy in sight within the house, never let him sneak around unattended. By watching him, you will notice his actions prior to an accident. Usually, sniffing around or acting funny is a good indication he's ready, quickly take him out to the bathroom. Don't get frustrated when puppy potty training, keep at it and before you know it, he will soon be house broken. We wish you all the best with puppy house breaking. If you are having problems or need more advice, feel free to write. The gang and I will get back to you as quickly as possible:) Remember, crate or den, schedule, frequent bathroom visits, your watchful eye, patience, persistence, and understanding are top priority for puppy house breaking success.